Everyone will agree that the Roomba 980 and the Dyson 360 Eye are the best robot vacuum cleaners in the market. However, this remains a very vague recommendation because you only want one vacuum cleaner between the two. 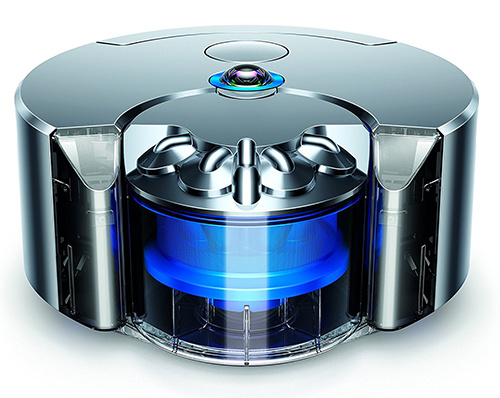 So, the big question remains, what is the best robot vacuum cleaner between the Dyson 360 Eye and the Roomba 980. If you are torn in between the two, you just came to the right place. We have carried out intensive research and tests with these two vacuum cleaners to come up with a detailed comparison review. 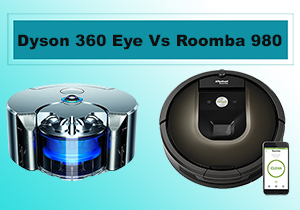 So, without further ado, here’s how the Roomba 980 vs. Dyson 360 Eye battle fairs on. The Roomba 980 symbolizes excellence as far as robot vacuum technology is concerned. Even though it is very expensive, the Roomba 980 is worth every penny of the $899 price tag. By November 2015, I had already received this robot which I used for the entire month. I must say that I liked everything about its performance but the price is not welcoming. Personally, I prefer the Roomba 960 because it is cheaper even though it doesn’t have Carpet Boost. I don’t like carpet floors so this is not a concern to me. The AeroForce 3-stage cleaning system comes with a tangle-free multisurface brush system that greatly reduced tangling unlike the Roomba 690 and 890. Together with the 10x more air power, this is a great combination for pet hair. I must commend its action on pet hair and as well as allergens which make it double up as a suitable robot for allergy sufferers. Generally, if you are looking for versatility, the Roomba 980 is a great choice; it works on all hard floors and carpets. Besides, it is a great vacuum for pet owners and even allergy sufferers. The best thing about the Roomba 980 and what actually makes it a real threat to the revolutionary Dyson 360 Eye is Local Visualization that uses a camera for real-time navigation. This makes this vacuum cleaner a great choice for those with high-traffic rooms. I used it when living in this small apartment that was very crowded. Thanks to iAdapt 2.0, it got stuck less frequently compared to the Roomba 650, iLIFE V5s and other robot vacuums that I owned at that time. For such an expensive vacuum cleaner, the Wi-Fi and Alexa/Google Assistant compatibility is not a major talking point. However, nothing lacks a flaw and this robot cleaner is no exception. It is also very pricey considering it only sweeps and vacuums when lesser brands like iLIFE have perfected the art of combining vacuuming and mopping in the same robot. On the other hand, the ECOVACS Botvac Connected and ECOVACS DEEBOT R95 have the same features save for the Local Visualization and cost around $300 lesser. I am part of the bunch that believes Dyson didn’t live up to the hype. 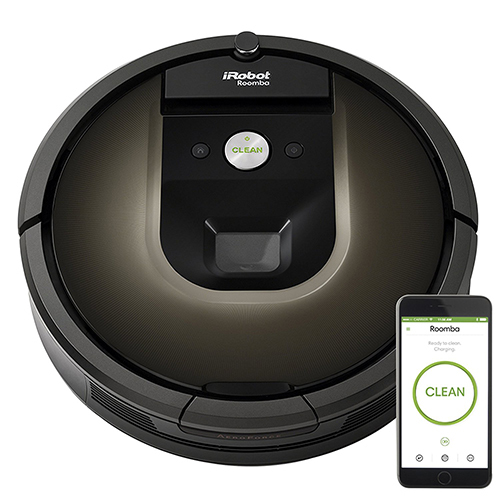 I tend to think the marketing team was better than the R&D team because, with all the hype, there’s nothing new that the Roomba 980 doesn’t have. One thing I liked about the Dyson Eye is the small diameter that allowed it to fit in tighter spaces. Compared to the Roomba and many other vacuum cleaners, its, maneuverability is enviable. It also offers the best cleaning on hard floors and even carpets. However, it was not built with pets in mind. Now that it has a very short runtime, it was built with a full-width brush to cover more area and I found this to be quite a great feature. My living room had around 350 sq. ft. and it managed to clean it entirely on a single charge. The talking point of Dyson 360 is its navigation. It has been built with a unique 360 degrees vision system with a real-time camera so you won’t have to worry about getting stuck. The tank wheels also offered seamless transitioning from the hard floors onto carpet floors including thick carpet. Besides this, it comes with Wi-Fi and voice control which is expected for a $900 robot vacuum cleaner. However, in as much as it is a high-end robot vacuum cleaner, I find it very expensive considering it vacuums only. Besides, it doesn’t offer the best pet hair cleaning like the Roomba 980. Also, the 4.7-inch height is ridiculous while the lack of boundary marking makes it a rip off for such a high-end cleaner. Even though their performance is almost on the same level, the Dyson 360 Eye and Roomba 980 have very different features. In this segment, we are going to see how they compare by focusing majorly on their biggest differences before giving our verdict on which one of them carries the day. When it comes to aesthetics, I like Dyson more because it gives us something different from what we are used to. Unlike the 980 that has been finished in rather dull colors, Dyson Eye is available in Nickel/Blue and Nickel/Fuschia. It also has a smaller footprint that allowed it to fit in smaller spaces. However, Dyson really failed when it came to its height. At 3.6-inches high, I find the Roomba to be very tall but now, Dyson is 4.7-inches high. This is just ridiculous! I must say that I liked how these two companies perfected the cleaning performance of their vacuum cleaners. They all clean hard floors and carpets effectively. However, Dyson Eye wasn’t built with pets in mind while the 980 delivers exceptional performance in pet hair cleaning. They also have different brush systems. While the 980 has a tangle-free multisurface brush with debris extractors, Dyson engineered the 360 Eye with a normal brush but is full width meaning it stretches its entire diameter. Also, it is worthy to note that these two cleaners have different bin capacities. Personally, I dislike Dyson’s 0.33 L tank because you will have to be emptying it frequently. The only good thing about it is the full bin indicator. When it comes to battery runtime, Dyson really disappoints. While the Roomba can do a cool 120 minutes, Dyson can average 45 – 60 minutes depending on whether you are in Max mode or Quiet mode. Regarding charging, they all average 180 minutes. What if you don’t want your cleaner to reach certain areas? This is the reason top robot vacuum brands have boundary marking. The Roomba 980 comes with Virtual Walls; a technology that uses invisible barriers to mark boundaries where the Roomba is not supposed to reach. It is so sad that with the almost $1000, Dyson never included any form of boundary marking. Even though they are known to be among the few robot vacuum cleaners with camera visualization, their approach to cleaning is quite different. I learned that with the Roomba’s iAdapt 2.0 with Visual Localization used parallel lines when cleaning. On the other hand, Dyson’s 360 Degrees Vision System uses a 10-feet grid pattern. Our Verdict: Roomba 980 or Dyson 360 Eye? From our review as well as expert opinion, the Roomba 980 is the best robot vacuum cleaner. It is well suited for those with large floors, carpets and pet hair. Compared to the Dyson Eye, it also has extra features that give homeowners the convenience they deserve as far as home cleaning is concerned. Besides this, it is cheaper by around $100.